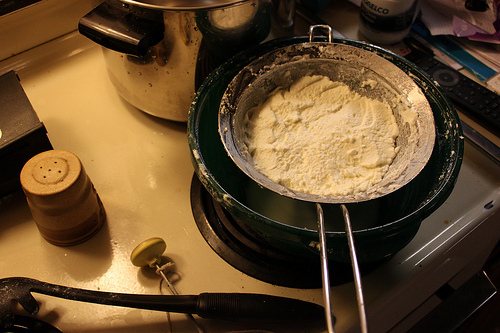 I just returned home from a cheese making workshop. The venue was a local farm education center that holds classes about gardening and small scale farming, gives tours of the test gardens and of course, presents workshops and seminars on topics interesting to the public. The presenter for the day was a professor from a university up the coast well known for their farm dairy and cheese making facility. Dairy farmers and cheese makers from all over the state attend their seminars and workshops as part of their continuing education required by industry guidelines. Following introductions the professor dove into an hour long educational segment on the intricate workings of a cow’s mammary system, the complexities of how milk is actually produced, the rules and regulations governing commercial milk production and the sale of milk products to consumers. He spoke in scientific terms about the anatomy of the mammary system, the internal pumps that make milk flow and the process that pushed protein into milk. We learned about various diseases that affect commercial dairies and the methods dairy farmers practice to prevent and treat disease. The professor even touched on small farm dairies, their involvement in the industry and, much to my disappointment, the downside of small dairies, those with less than 50 cows, to be viable contributors in the milk market. To say I was stunned would be mild. Was he bashing family farms or organic farming or sustainable agriculture? Or, was he purporting that corporate farming was the only kind of farming that was viable and the only kind of farming that should be allowed. But, I wasn’t the only person that found this tone of the lecture objectionable. Several people debated with him on the positive impact small farmers and organic farmers have had on the whole picture of California agriculture. When the group was reined in, the lecture continued. The speaker toned down the rhetoric and I reminded myself that I was here to learn about cheese making not enter into a controversial discussion about today’s Ag practices. The information was interesting, technical and in depth and a little over the heads of we folks who came just to learn more about making cheese. But, all was not lost. After a short break he resumed the lecture. This time though the topic was all about cheese, the origins, the making of and best of all, the eating of. He talked about the most basic cheve to the most time consuming cheddar and parmesan. We tasted different varieties and talked about how they were made, the equipment needed, the steps involved and strangely enough, he talked quite a bit about small production farmstead and artesian cheeses, their quality of ingredients and their superior flavor and texture. The woman sitting next to me and I locked eyes with those comments and just shrugged at how the pendulum had swung. How could he promote small production farmstead cheese and artesian cheeses while condemning the dairies that produced its main ingredient? I was befuddled. Oh well, in the end, it was an interesting and educational morning, where I learned more than I expected to about the dairy industry and cheese making. And, when all is said and done, I control who I buy my milk from and the kind of milk I buy – organic or conventionally produced. I just won’t tell him I make cheese from goat’s milk.